Google says the World Wide Web is a big place and what we all need from time to time is an experienced tour guide. As a result, the folks over at the Googleplex have trotted out Google +1, an experimental feature that enables those with a Google Profile to share recommendations with their friends and colleagues right in Google's search results. By clicking the +1 button associated with particular search results, users of the world's most popular search engine offer a personal endorsement of a product or service that they've supposedly tried themselves. It's shorthand for "Check this out," "This is pretty cool," or "Trust me, I recommend this!" It's a stamp of approval that Google believes will carry significant weight because it comes from a friend, business partner or acquaintance rather than a stranger. The goal, according to Google, is to get personalized relevant results for your search efforts, as well as recommendations from those whose judgment in such matters you trust. For instance, one of your customers finds the search result for your senior-care facility that took dynamite care of his or her mother. That certainly made a difference in people's lives, so your customer places a +1 on the Google search result for your franchised senior-care facility. That a bona fide customer made the recommendation, and not some PR firm that represents the business, is a -- well, a big plus -- for you, the business owner. Likewise, maybe a potential customer is looking up a recipe for cupcakes on Google and spots a +1 recommendation from a friend on one of your cupcake shop's blog posts. The potential customer has never had any complaints about meals prepared by the friend, and so prints out the recipe and turns on the stove. It's that simple. Your customers are getting great tips from people they trust. Think of it as Yelp-meets-search-results, and you can see where this has the potential of going. In making the announcement, Google said it has plans to incorporate other signals, including users connections on Twitter and Facebook, to make sure your recommendations -- and those you receive -- remain relevant. But here's the catch -- and as far as I'm concerned, it's a pretty massive one, which ultimately may spell doom for +1 -- to participate in the +1 program, searchers must already have a Google profile. And if you've already done that, you'll need to upgrade it, which, while quick and painless, is likely too big a hurdle for +1 to overcome. 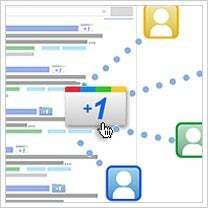 Remember Google Buzz or Google Wave? My point exactly. Both required Google accounts, and not everyone has or needs one of those (yet according to comScore, over 65 percent of us use Google on a regular basis). In other words, there's a significant difference between using Google.com for search and going through the process of creating a Google account, which isn't necessary for the vast majority of people who use Google for search. For now, Google is still in the experimental stage with +1, but it is inviting anyone who is interested in testing the waters to visit http://www.google.com/experimental/index.html. Meanwhile, if you're a business owner and you want to know more about how the +1 system works on websites, blogs and search ads, visit http://adwords.blogspot.com/2011/03/1-button-adwords.html. Do you think +1 is likely to catch on or fall flat? Share your thoughts in the comments below.